This description of the Book of Ruth is from Easton's Bible Study. 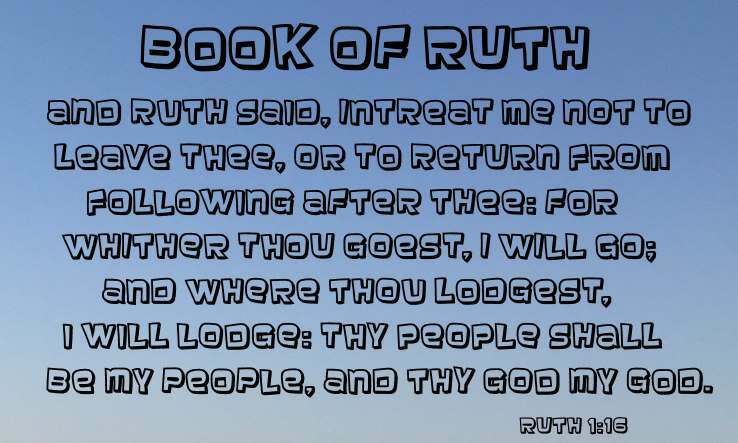 "Ruth, The Book of: was originally a part of the Book of Judges, but it now forms one of the twenty-four separate books of the Hebrew Bible. the birth of Obed, of whom David sprang. The author of this book was probably Samuel, according to Jewish tradition. "Brief as this book is, and simple as is its story, it is remarkably rich in examples of faith, patience, industry, and kindness, nor less so in indications of the care which God takes of those who put their trust in him."" This description of Ruth is from Easton's Bible Study. "Ruth: a friend, a Moabitess, the wife of Mahlon, whose father, Elimelech, had settled in the land of Moab. On the death of Elimelech and Mahlon, Naomi came with Ruth, her daughter-in-law, who refused to leave her, to Bethlehem, the old home from which Elimelech had migrated. There she had a rich relative, Boaz, to whom Ruth was eventually married. She became the mother of Obed, the grandfather of David. Thus Ruth, a Gentile, is among the maternal progenitors of our Lord (Matthew 1:5). The story of "the gleaner Ruth illustrates the friendly relations between the good Boaz and his reapers, the Jewish land system, the method of transferring property from one person to another, the working of the Mosaic law for the relief of distressed and ruined families; but, above all, handing down the unselfishness, the brave love, the unshaken trustfulness of her who, though not of the chosen race, was, like the Canaanitess Tamar (Genesis 38:29; Matthew 1:3) and the Canaanitess Rahab (Matthew 1:5), privileged to become the ancestress of David, and so of 'great David's greater Son'" (Ruth 4:18-22)."